When converting labels to annotations I have specified a font size of 14. I have also created a number of callout text annotations within the map and specified exactly the same font, size and properties as the converted label annotations. In the data view everything appears to be displaying at the same size. However when I go into layout view I find that despite both entities having a font size of 14 they are displaying at noticeably different sizes! How can I ensure that all of my annotations and callouts display at the same size, without having to experiment with different font sizes? It sounds like you have created your two sets of annotation when the data frame was at different scales. 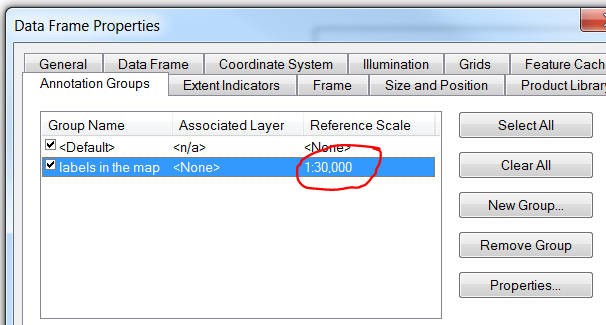 To avoid this and ensure that they are created the same size Set a Reference Scale on the Data Frame. when you say "created a number of callout text annotations within the map", are you talking about creating an annotation group within the map? If that is the case, are you seeing the reference scale to the appropriate scale (as in, matches your annotation scale or the data frame scale?) You can check by right clicking the dataframe, going to Properties and then the Annotation Groups tab should tell you the Reference Scale. Also, make sure you callout labels are in the right Annotation Group and not, say, default, by accident. Not the answer you're looking for? Browse other questions tagged arcgis-10.1 arcgis-desktop maps labeling or ask your own question. How to label a lot of nearby points?